The temps are falling quickly here in New York. Most days we’re in the 50s here in the suburbs with near freezing temperatures at night. I love it! This time of year calls for fires in the fireplace, warm soups on the stove, and nights on the couch under blankets. My oldest son seems to be taking after me in his love of being warm and cozy, so we were both excited to review a hot water bottle from Warm Tradition. I (well, “we” really!) 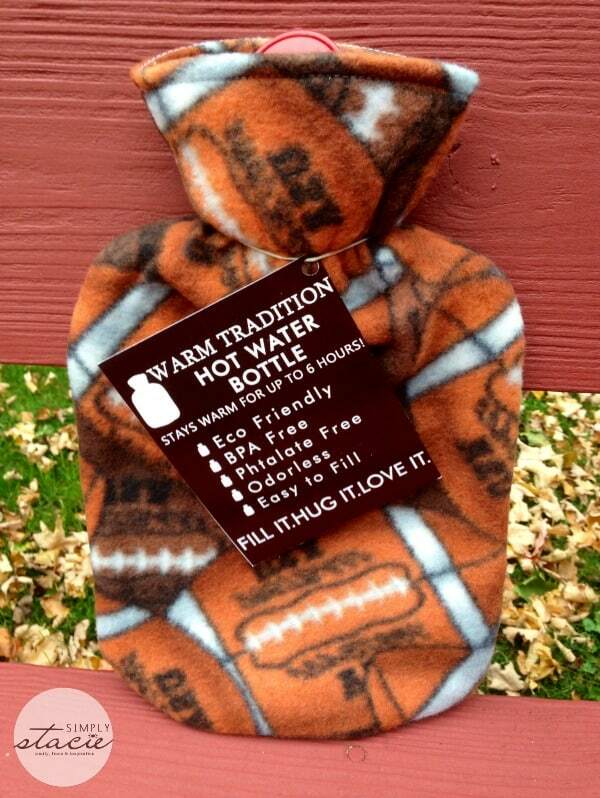 received a Football Fleece Covered Hot Water Bottle for review. I chose the football pattern because I thought it really brought home the fall feel. The fleece cover is warm and inviting, and best of all, machine washable! I have always loved using a traditional hot water bottle for minor aches and pains and for general warmth. The Warm Tradition bottle gives you those benefits with a stylish array of covers to fit every taste. 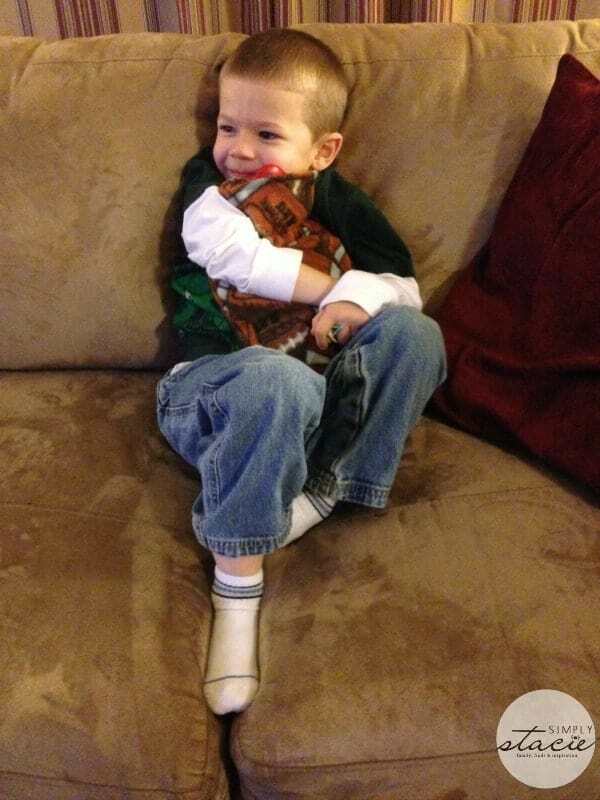 My son loves cuddling with this bottle to keep him warm while watching movies, and I like to use it when the day is done and I’m relaxing on the couch with my favorite TV shows. I can see this bottle getting a lot of use this winter! The bottle I received for review is currently on sale on the Warm Tradition site for $19.95. These bottles would make great gifts for parents, grandparents, college students, or any one in your life who likes that cozy feeling! Warm Tradition’s hot water bottles are made in Germany under strict European guidelines. The covers are crafted in the USA, and come in a variety of styles and fabrics. All of their hot water bottles are BPA and Phtalate free. The thermoplastic design keeps the bottle hot for an average of six hours, and the ribbing on each bottle is designed to evenly distribute the heat. The mouth of the water bottles is extra large which makes for easy filling, and the easy grip cap secures tightly (tightly enough that I didn’t worry about spills when handing it over to my 5-year-old!). Besides making a great product, Warm Tradition also created a program called Warm the World, where for each water bottle that is returned for recycling, one bottle is donated to someone in need. To see all the great design options Warm Tradition has to offer, check out their website. I really like the Warm Tradition Pink Cheetah Print Hot Water Bottle Cover. i like the Warm Tradition Charcoal Cable Knit Covered Hot Water Bottle – Bottle made in Germany. I love the Warm Tradition Cuddly Dog Pillow Hot Water Bottle. I like the Fashy Natural Grain Heat Wrap. I really liked the Soccer ball bottle. Warm Tradition Orchid Fleece Covered Hot Water Bottle-BLUE- Bottle made in Germany, Cover made in USA.